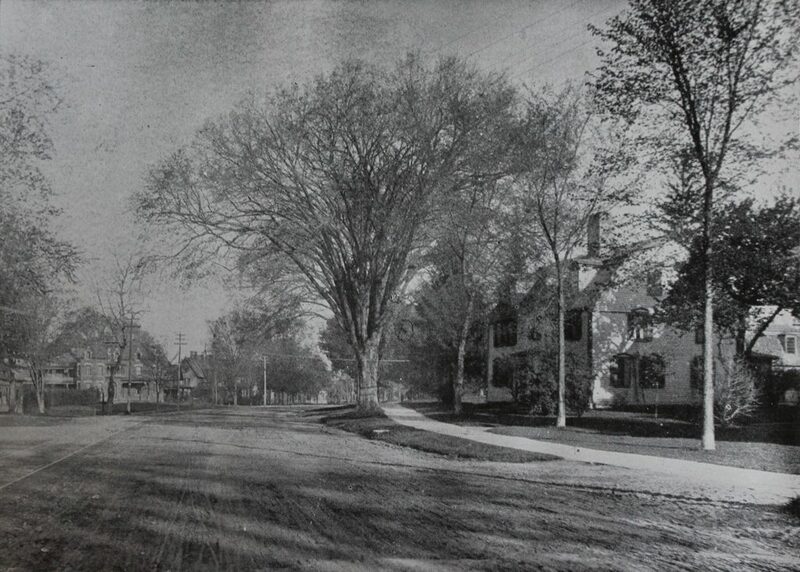 Looking northwest on Elm Street from near the corner of Henshaw Avenue in Northampton, around 1894. Image from Northampton: The Meadow City (1894). 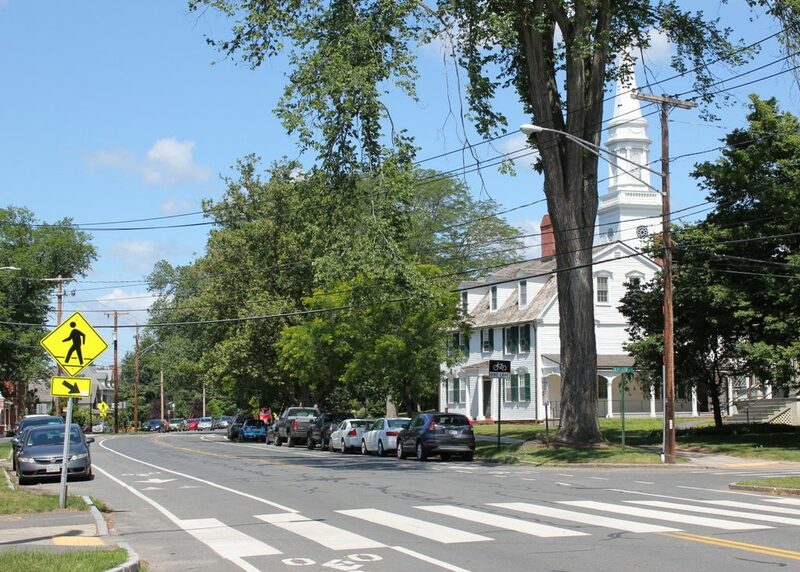 A lot has changed here on Elm Street in more than 120 years, but one prominent landmark that remains is the Hunt/Henshaw House, seen here on the right side of both photos. Many sources give a construction date of around 1700-1710, with Jonathan Hunt as the original owner. Hunt did indeed live here at the corner of present-day Elm Street and Henshaw Avenue, but more recent research seems to indicate that the current house on the lot was built in 1751 by his son, John Hunt. A wealthy landowner and a militia captain, John Hunt lived here with his wife Esther Wells, and their large, elegant Georgian-style house reflected the family’s economic and social prominence. After John Hunt’s death in 1785, the house was inherited by his daughter Martha, who lived here with her husband, Samuel Henshaw. Originally from Milton, Massachusetts, Henshaw was a pastor-turned-lawyer who came to Northampton in 1788. He later became a judge of probate, then a judge on the Court of Common Pleas, and also served as a trustee of Williams College from 1802 until his death in 1809. Like the Hunts, the Henshaws were also a prominent family, and their oldest daughter Martha married Isaac Chapman Bates, a lawyer and politician who went on to serve in the U.S. House of Representatives from 1827 to 1835, and in the Senate from 1841 to 1845. Martha and Isaac were married here in this house in 1807, in a double wedding ceremony that also included Martha’s sister Sarah and her husband, Ebenezer Hunt. The older Martha continued to live here in this house long after Samuel Henshaw’s death, until her own death in 1842. The house was later owned by Sidney E. Bridgman, a local bookseller who lived here in the late 19th century, and by the turn of the 20th century it was owned by Ruth Sessions. The daughter of Episcopalian bishop Frederic Dan Huntington, Ruth was an author who published poems, short stories, and articles, and later in life she published a memoir, Sixty Odd, in 1936. Ruth was also the mother of prominent composer Roger Sessions, and the 1910 census shows him living here in this house as a 13-year-old boy, shortly before he entered Harvard University to study music. Ruth Sessions converted this house into a boarding house for students at Smith College, which is located right across the street from the house. Sometime before 1916 she added a large wing to the rear of the original 18th century house, which significantly expanded its capacity while preserving the historic appearance of the house. In 1921 she sold the property to Smith College, and it was named Sessions House in her honor. Nearly a century later, it remains in use as student housing, and it is the oldest of the school’s 35 residential buildings. Aside from the Hunt/Henshaw House, the most prominent feature in the 1894 scene is the large elm tree in the center of the photo. John Hunt had planted elm trees in his front yard in 1753, and this tree could very well have been one of them. It is no longer standing, perhaps a victim of Dutch Elm Disease in the mid-20th century, but there is another elm tree that now towers over the house, on the right side of the present-day scene. Such large elm trees are rare, since most die of Dutch Elm Disease long before reaching this size, but it still stands as one of the few survivors on the eponymous Elm Street, which was once lined with many of these trees.